them. You will also need to set the passwords to something appropriate. As a kickstart it offers some examples, but as you can see there is not users configured. If we try to modify the file we will see that the changes get lost when the container stops. In order to persist the changes we can either do a commit of running container, as we will see next, or crate a custom image, we will see later. If we access to a running container and try to make changes inside it it will be lost when the container is stopped. A way to save those changes is doing a commit creates an image from the current state of the container. About the options: author defines who is in charge of the new image. message is a short description about the new image layer. change adds Dockerfile options to create the image. As can be seen, a custom image is created from the changes on the container but is it actually working? Let’s see. < WWW-Authenticate: Basic realm="Tomcat Manager Application"
Another more recommendable way to create custom images is to use a file that defines how the image should be built. This file is called Dockerfile, and has several instructions to configure the build process. In fact, if we want to add the code of our application this is the way to do it because the base image could not have the necessary tools to get the code such git, wget, curl, etc. There are several instructions to define inside the Dockerfile, bottom you can see some of them and here you can find the complete reference. FROM: we define the base image to build our custom one. It could be an image created by us and present in our local repository or we can use one from dockerhub. ADD / COPY: the function is almost the same, add files into the image. ADD is able to get the files from remote servers while COPY can only use files from the host where we are creating the image. The behavior of ADD with compressed files is to decompress inside the image, but COPY copies the file as it is, a compressed one. You can use the one that suits to you. Now we have two images, the commit one in the repository my_images and the Dockerfile in the repository new_repo. The way to add our application code to the container is the same used to enable access to manager console. Docker offers a public repository where we can upload our images. First you need to be registered in https://hub.docker.com. Once we have our account let’s upload our image new_repo/tomcat-test. But we need to adjust the image name to match our repository in docker, in my case the repository is called dmartin. We will use docker tag. If we connect to dockerhub we can see the image uploaded. Next step, our git project. If you don’t have account it is a good time to create one. 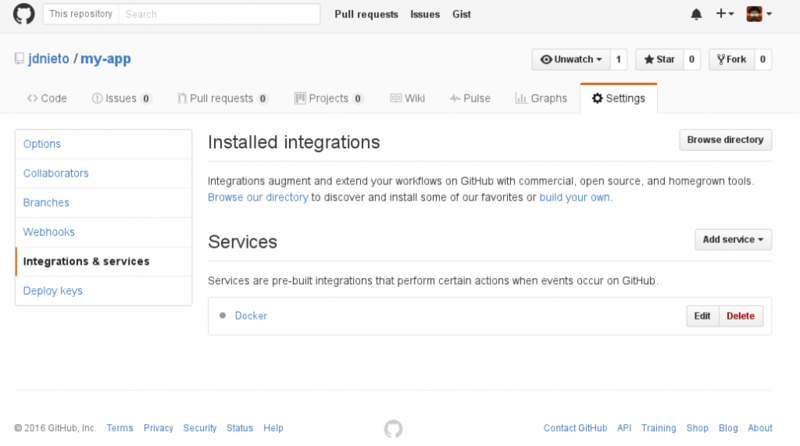 With github account and our project create, Docker allows us to link a service with github. Once done, every time we push changes to our github repository Docker will build a new image applying the changes. 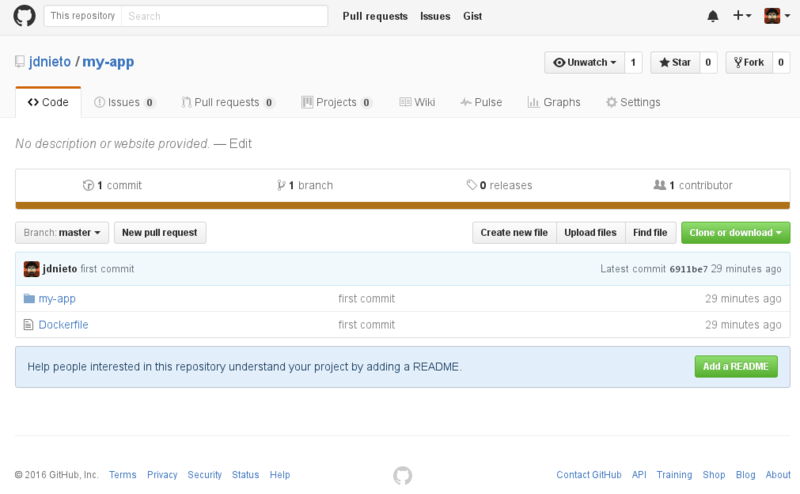 I’m going to use the same project my-app and create the repository on github. Now in our dockerhub account Docker > Profile > Settings > Linked Accounts & Services we can link with our github account in two ways: Public and Private is the recommended mod that allows to create the triggers to build the image, Limited read only access. I am going to use the recommended one and it will open a tab to authorize github access. Onc again in dockerhub, on the top right corner, near our profile, there is an access to Create > Automated Build. Once clicked we can chose our github account and after that select the repository and the branch, in my case my-app on the master branch, and also we need to add short description of the automated process. If we go to github > my-app > Settings > Integration & Services we can see the Docker linked service. It is important to remember that in the root of the project should exists a Dockerfile that will be used by dockerhub to build the image. Let’s add a new JSP to our project. $ git commit -m "added date.jsp to show the date"
Is time to use our image, and test the new JSP. This is the end of the Docker introduction tutorial. There are lots of stuff that Docker offers, but I leave you to discover for yourself . See you.